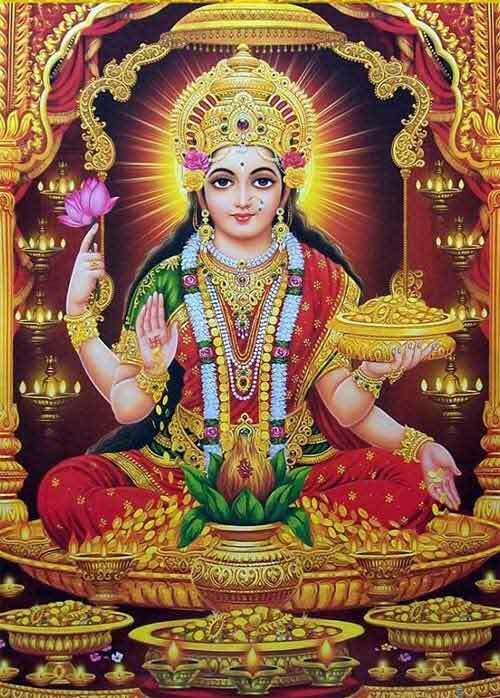 Mahalakshmi Vrat and Puja, dedicated to Goddess Lakshmi, is observed for 16 days starting from the eighth day of the Shukla Paksha (waxing phase of moon) of Bhadrapad Month (August – September) as per traditional Hindu calendar followed in North India. 16 days Lakshmi Vrat and Puja in 2019 begins on September 6 and ends on September 21. Mahalaxmi Puja and Vrata dates are based on the North Indian calendar and this particular Vrat is only observed mainly in North India. The 16-day Mahalakshmi Vrata ends on the eighth day of the Krishna Paksha of Ashwin month (on the Ashtami day of waning phase of moon). The Vrata is observed mainly by women but in some communities, men also observe the rules associated with the Vrata. Non-vegetarian food is avoided during the Vrata period. The popular belief is that Goddess Lakshmi blesses devotees with wealth and prosperity during the period. Tying the sacred thread having sixteen knots after traditional puja is an important ritual during the period. A specifically prepared Kalash symbolizing Goddess Lakshmi is worshipped on the last day of Mahalakshmi Vrata. Gaja Lakshmi form of Mahalaxmi is worshipped during the period. The greatness of Mahalakshmi Vrata was explained to Yudhisthira by Lord Krishna. Yudhisthira wanted to know about a Vrata with which he can get back all that he had lost including property and wealth. The importance of the Vrata is also mentioned in the Bhavishya Purana. How to observe 16 days Lakshmi Vrat? The Lakshmi Vrat in North India begins on the Bhadrapada Shukla Ashtami morning with special prayers to Goddess Lakshmi. Gaja Lakshmi is worshipped during the period. After taking bath, usual prayers are offered to Lakshmi. A murti or picture of Gaja Lakshmi is installed in the puja room. Some people make sixteen knots using a string and tie it on the left hand. Sixteen Durva grass is dipped in water and is sprinkled on the body. The main ritual during the Vrata is abstaining from non-vegetarian food, waking up early taking bath and praying to Goddess Lakshmi for prosperity. Normal pujas are performed on all days like lighting a lamp, incense, and dhoop etc. You can also listen to Lakshmi Sahasranama or other bhajans or Mahalakshmi Vratha Katha dedicated to Goddess Mahalakshmi during the period. If possible you can perform Shodashopachara puja on all days. Naivedya or bhog should be prepared using wheat. The Vrata ends on the Ashwina Krishna Ashtami day with evening prayers dedicated to Goddess Lakshmi. A Kalash or Purna Kumbha is worshipped as Mahalakshmi on the last day. A bronze Kalasham (pot) is filled with water, akshatas, couple of coins etc. The neck of the pot is decorated with betel leaves or mango leaves. The pot is smeared with kumkum, sandalwood and turmeric paste. A coconut is placed on the neck of the pot and is also smeared with kumkum and turmeric. A new cloth is tied to the Kalasha and it is worshipped as Goddess Lakshmi.